Looking for the best glass cleaner? There are many different products on the market for cleaning your windows but which ones are the best? In this article we will go over a few tips, recommendations and best products to help you get your windows clean and streak free. It is recommended that you clean your exterior glass at least twice a year. Indoor glass surfaces should be cleaned as need. If you can’t see yourself in the mirror or can’t tell if it’s sunny outside, you should probably get to work. 1. For very dirty windows, wash them off with a garden hose first. 2. 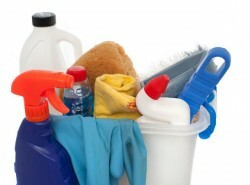 Make cleaning solution by adding some soap or cleaner concentrate into a bucket of water. Use a sponge or a window washer with a long handle to clean the glass. The soapy solution will loosen the grime and wash it away. 3. Use a squeegee to get the soapy solution off the pane. Start with top left corner and move in reverse “S” strokes. After each stroke clean the squeegee’s blade with a clean rag. 4. Clean the leftover water on the sides of the pane with a moisture absorbing cloth. 5. You may apply the glass cleaner to take care of any soapy streaks and to add that perfect shine. • If you are using soapy solution to clean an extremely dirty glass, don’t use too much soap. It will leave a soapy residue on your coffee table. • For any homemade window cleaning solution use distilled. Hard water contains minerals and will leave residue and streaks. • Don’t use paper towel to buff the glass. Yes, it may seem as the easiest and most rational solution, but it will also leave you with streaks and lint trails. Whenever possible, utilize microfiber cloth such as E-Cloth Window Cleaning Cloths or old newspapers. • When cleaning, don’t need to spray too much solution on your windows as it will run down and make a mess. For spots that are quite soiled, just spray a bit on the spot and wipe to remove the grime. You can repeat this process for tougher areas. • As the cloth gets wet you might want to exchange it for a dry one as this will help to keep the streaks off the windows. It’s a wise idea to use one cloth to clean the windows and then one or two to dry the window. So what is the best glass cleaner on the market? Windex has become a household name for a window cleaning solution, but it doesn’t mean there aren’t any other great or better alternatives. Here are some of the best glass cleaners on the market. This glass wax is a professional cream style polish that you can use to clean and protect your windows. It won’t leave streaks and keep mirrored surfaces as well as regular glass clean. Glass Wax Cleaner will remove all those tough water spots, cut though grime, repel water and will last for a long time. We have also found that this product really lives up to its name “NoStreek”. It is also economical as you need to use only a few drops to get the best results without the frantic scrubbing. Another important factor in ranking this product as one of our top choices is its price. This concentrated glass cleaning product from professional window cleaning company Ettore is designed to be used with squeegees. It will cut through grime and tough grease with its specialized grade formula. It’s biodegradable and ammonia free and comes with a “No Streaks” guarantee. We found that this cleaner does an amazing job on the windows and provides high quality, quick results time and time again. It’s also great for those larger cleaning projects such as sliding doors. Keep in mind that this is a concentrate so make sure to use a small amount of the product and follow the directions for best results. If you need a glass cleaner with more power than regular cleaners you might want to consider this almost legendary product. It was designed with two things in mind: excellent cleaning power and unmatched clarity. It comes in a spray bottle so it’s not only powerful, but also easy to use. It contains no dyes, foams, soaps or scents and does best what a glass cleaner supposed to do – clean glass surfaces with no smudges. It will remove difficult grime, sap, smudges, smoke haze, adhesives, droppings, bugs, and other problematic residue from your glass, mirrors or windshield. It is slightly more expensive than a simple glass cleaner, but may be well worth the price. This simple glass cleaning product produces a great shine and falls into a lower price range. But no make no mistake – it is an excellent everyday glass cleaner. It cuts though grime, grease and dirt to get the windows clean and streak free. Another advantage is that Glass Plus is versatile – it also works great on stainless steel, fibreglass, chrome, countertops, appliances vanities, granite and more. An additional great feature is that you don’t need to use a lot of solution to get the best results. So if you are looking for a simple, but powerful, inexpensive, and easy to use glass cleaner, Glass Plus might be for you. Want that sparkling, streak free glass, but don’t want to use any cleaning solutions and waste rolls of cleaning towels? Then E-Cloth window Cleaning cloths are just for you. These cloths’s fibre construction is designed to remove oil, grime, grease, and other residue from your windows with just good old water. We were quite surprised with the results. They left windows and mirrors streak and dirt free without using any chemicals. While they might not polish or protect glass surfaces to repel dirt, they made window cleaning easy, fast and effective. The company claims that e-cloths are also good for 300 machine washings so they will last you for a long time. E-cloth is a great, natural alternative to more conventional glass cleaners. Keeping your glass surfaces doesn’t have to be difficult if you choose a good product. They can make cleaning easier and keep your windows clean longer as long as you follow the instructions and are not afraid to use a little elbow grease. • Clean your windows from the top to the bottom. Otherwise, excess cleaner will run off and you will have to start over. • Clean the windows when it’s cloudy out as the sun can dry your solution quickly and leave streaks on the surface. • To get into the corners of the glass use some cotton swabs. • Use clean cotton cloths to wipe with. Older cotton shirts work well because they have little lint. Avoid new cloths as they will leave cotton residue. • Avoid the wood frames around windows and be sure not get any of your solution on them. Always wipe off the cleaner if that happens. • Polishing the glass not just makes it streak free, but also repels water and will keep your panes clean for a longer time.